The South African market is represented by the All-Share Index, or ALSI in much the same way as the US market is represented by the S&P 500, and by the DJIA (Dow Jones Industrial Average). I have been keeping an eye on things with my TT software, and thought I would offer up some thoughts, and invite some discussion about the SA market and where it’s going. 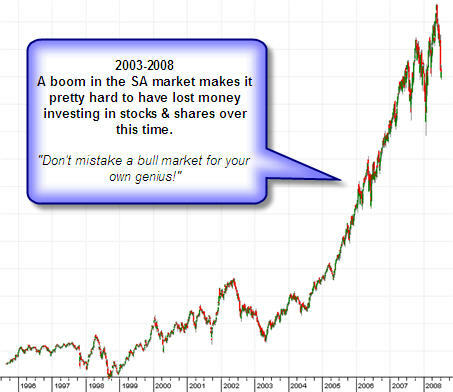 As this chart shows, the SA market has been in the grip of a roaring bull for the past 5 years. In fact it shows signs of being a pseudotrend, but that will have to be a discussion for another time (a pseudotrend is a strong move that is bolstered by fundamental interaction – in this case I suspect the Rand/Dollar exchange rate might have a lot to do with it). Things started to falter in October last year, but recovered from January to May this year (see this post). Since then it’s been tumbling. While we’re looking at the big picture – the 54 month (4 1/2 year) cycle is fairly clearly discernable, with a trough in late 1998, and another in mid 2003. (I haven’t shown the cycle phasing on this graph because by the time I scale the picture down for the web, the phasing is little more than a smudge). It is possible that the trough of January this year was another trough of this cycle, but the software chooses instead to say that trough still lies ahead of us, and indicates that the cycle (due to the Principle of Variation) is currently running long at 61.3 months). Time will tell whether this is in fact correct. If it is we could be in for some tumultuous downside action (the move down to the trough of a longterm cycle is often fairly dramatic). If it is not correct, and the cycle did form a trough in January this year then we should instead see some good upward action! Bottom line – the software indicates that the market is coming down into a 20-week nest-of-lows, expected anytime from about yesterday to about 3 weeks from now. Notice the 10 day and 5 day cycles are both overdue, but this is not a reason to say the market “isn’t turning yet” – coming into a big nest-of-lows the shorter cycles are often completely squashed by the heavy pressure of the longer term cycles, so we might not see any clear 5 or 10 day troughs before the big 20-week trough. From here the software is predicting a move up – all the way up to about 34000, which is interesting because if the market really is this late in the 61 month cycle, we shouldn’t be seeing another higher peak – however the software does include Sigma L (the sum of all cycles longer than the software can determine, which includes all possible pseudotrend), and so it is possible. It will be interesting to see if the market really does get up there. The lower level of the target zone is about 32000, which itself would be a higher peak. Price is currently at the mid-channel-pause level of the 18-month cycle, indicated by the fact that price is almost touching the 18-month FLD (the very thin yellow line which can be seen best to the left of the green BUY zone box). Price could cross this line without it having much significance, but it does indicate that price has reached a mid-channel reversal point. 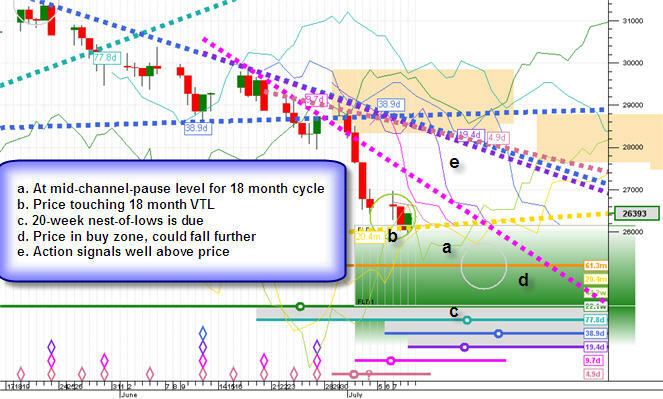 Price has come right down to touch the 18 month VTL. This fact isn’t greatly significant of itself – but if price manages to stay above the VTL, it is an indication that we haven’t yet seen the 54-month peak – so the chances are better of us getting a higher high (as the target mentioned above suggests). If price crosses below this VTL decidedly, then that would indicate that we have seen the peak of the 54-month cycle, and the chances of the market reaching a higher high are smaller. 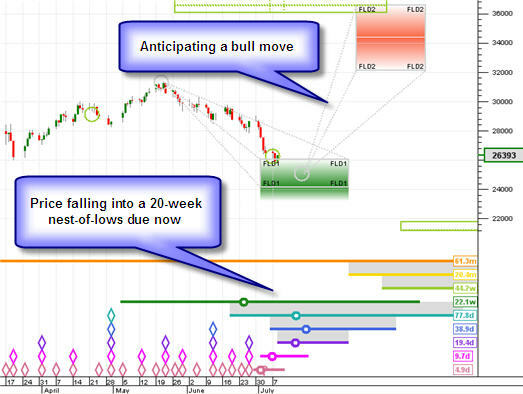 It wouldn’t remove the chance of there being an upward move at this point, but it would LOWER the target somewhat. Of course the 18-month VTL would be in a different place if the “alternate” mentioned above was true – that we have seen the 54-month trough back in January. The 20-week nest-of-lows is due now as mentioned earlier. Note that if the phasing analysis is not quite correct, this could in fact be a stronger nest-of-lows than 20-weeks – which doesn’t change our outlook, it’s really just an interesting point. Action signals are well above price. The action signals I’m talking about here are the signals that would indicate that the nest-of-lows has occurred (yesterday for instance). The shortest action signal that would have any meaning at the moment is the 20-day cycle VTL or FLD. Both are well above price, so I would certainly not be about to start buying just yet. But next week the 20-day FLD drops fairly sharply, and I expect that next week I’m going to be standing-by to identify the 20-week trough. Another small point of interest: Elliott wave fans might be able to count a fairly clear a-b-c 3-wave correction, which is an indication of how Elliott and cyclic analysis although taking slightly different approaches often indicate the same results.